If there’s such thing as an “easy sell” in our house, nothing pleases everyone more than absolutely anything I make whose name starts with chocolate. In fact, my kids’ cheers of joy usually drown me out before I can even get the whole word out of my mouth. Take these Chocolate Muffins for instance. Recently, my two little angels were in the midst of a quarrel at the kitchen table and I was starting to lose my patience from all the bickering. Using my best diversionary skills I announced to them, “I made chocol…”. They were sold before they even knew what it was that I made — amazing, the power chocolate in any form has over my kids. After each of their first bites, there was peace in the world (at least momentarily)….and something delicious in their tummies. 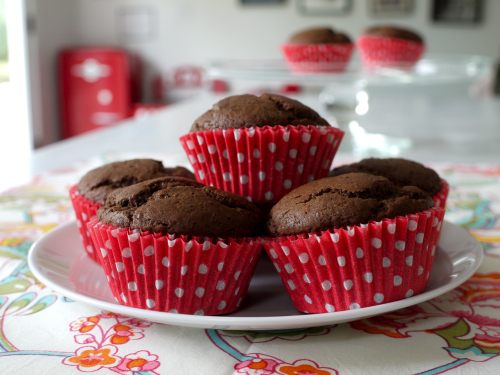 These chocolate muffins are light as a feather, but also pack a rich punch of chocolate. The next time you’re trying to grab everyone’s attention, just whip up a batch of these and watch what happens! *The ever sweet and talented Recipe Girl posted these muffins on her site last week, but just in case you didn't see them and wanted to make sure you got to see them here! 1. Preheat the oven to 400° F. Grease 12 regular or 24 mini muffin tins. 2. In a medium bowl, sift flour, cocoa powder, sugar, baking powder, baking soda, and salt. 3. In a large bowl, whisk together the milk, oil, and the egg. Add the dry ingredients and stir just until combined. 5. Bake 18 – 22 minutes (8-10 minutes for mini muffins), or until a wooden pick inserted into the center comes out clean. oh my goodness, i'm totally making these today!! do you think adding a handful of chocolate chips would be ok? I would! :) I do it all the time! How do we make these with whole wheat pastry flour? Sub out half the all-purpose flour for whole-wheat pastry flour. would you be able to use coconut oil in this recipe? 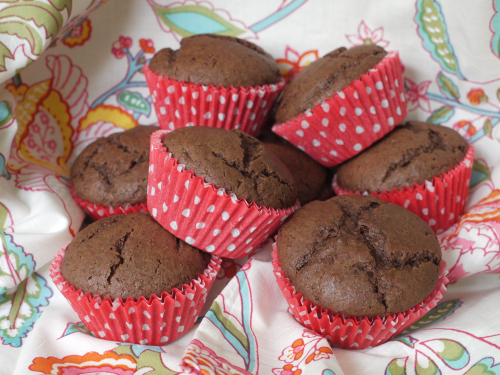 Technically, these would be Cocoa Muffins, as they do not contain any chocolate. I'm disappointed in your recipes these days. Many of them contain processed ingredients like white sugar, canola oil, and all purpose flour. I'd like to see you get back to using whole foods again. Thank you so much for your input! I take it to heart. Weelicious strives to offer recipes for all kinds of people. From dietary restrictions to pumped-up healthier alternatives as well as the occasional indulgent treat! I think the majority rules here. We love Weelicious and all it has to offer! Thank you, Catherine, for giving us such a wonderful resource for feeding our families. I love coming to your site every day, and look forward to all of your recipes, even the chocolate ones (let's be truthful here - especially the chocolate ones!) I believe in moderation, which is why I love Weelicious, and these recipes give me the tools to make treats for my family rather than opting for store-bought or from-a-box mixes. I love your philosophy on food and feeding kids, and I hope you keep writing this blog for a very long time! I'll be making these for sure! Sometimes sugar just works best and 1/2 cup for the whole recipe is not that much - esp for chocolate. And really, is there such a huge difference between sugar and alternative sweeteners?? I'm thinking of the high arsenic content that was just discovered in brown rice syrup. It's not always clear cut these days unfortunately. Weelicious has given me so many easy and healthy meals (and treats) for my whole family. Thank you Catherine! whoa mandi's comments are a bit harsh. i think the recipes are great. although some recipes contain processed ingredients, catherine's recipes provide an alternative to processed, packaged foods most mothers purchase at the market. not only are they on the healthier side, but they're super easy and delicious. as a mom, those are the only pre-requisites i need. if you're not happy, go somewhere else for whole foods recipes. great job catherine! Thanks for putting it perfectly, Karen! Agree w/ Karen, great job Catherine and many thanks!! If your not happy with the recipes then look elsewhere. Some of the recipes are fine in moderation just like anything else and honestly I would much rather give this to my son than many other things that are in stores. I've learned alot from this website and I love Catherine for what she is doing!!!! Ditto to marys comment. One of my favorite parts of the day is checking into weelicious and being inspired. You make me look like a superstar in the kitchen catherine! Thank u! Oh, and I wanted to add, it's so much better than all the additives of stuff sitting on the shelf for a few months. Everything in moderation! I appreciate the variety of foods offered on Weelicious. Some are super healthy, others are an occasional treat. All are homemade and offer parents inspiration for preparing foods for our children instead of buying packaged products with loads of preservatives and artificial ingredients. If a recipe doesn't appeal to me (for whatever reason) I simply don't make it. Katherine is doing us all a favor everyday that she delivers her wonderful emails to our boxes. Personally I don't know how she has time for a family and to make all these foods, photograph them and email them out! I'm impressed everyday I open her emails. Thank you!! I love the idea of these muffins...I try to make banana mini muffins on Sundays with the weeks' left over bananas, but with 3 kids 5 and under, there aren't always left overs! This is a great, fun alternative and mini muffins are the perfect size for kids to get a treat in a perfect, small size. Thanks for another yummy looking recipe, I can't wait to try these. I'm always looking for chocolate recipes that use cocoa powder since I always have some in the cupboard! Thanks. I also should tell you that I've been making the veggie lentil stew for my family and everyone LOVES it! I am all about chocolate and \"gasp\" I even let my children have them. I use organic sugar, flour, eggs. ect. Even though Catherine does not write it out DOES NOT mean you can not use it. I have been using her site for about 2 years now and my kids enjoy 99% of the foods I make from here. As for these muffins. This will be our afternoon snack and once again its SUPER SIMPLE that my 5 year old can help which I LOVE!!!!! How do u substitute coconut oil? Is it a 1:1 ratio? Yes, 1:1, but you may need to melt the coconut oil first. Made these this morning. They looked like they were going to be brownies, but they were not sweet. My three year old thought he was getting a super special chocolate treat! I added a little agave nectar on top, and it was just a tad sweeter for me. Nutella was also delicious! Nutella on these would be insanely delicious on these! If I wanted to substitute buttermilk for the milk is there a change to the baking powder volume? I always forget the alteration ... these look fun and not too sweet for breakfast. Thanks! You want to use 3/4 cup of buttermilk and 1/2 tsp baking SODA. Leave out the baking POWDER. Just pulled these out. For mini muffins only baked for 8 min then checked and they were done. Thank you! That would kick up the yumminess a notch! I made these this morning (added a tsp of vanilla)for an afternoon treat since we are having a friend and her newborn over for lunch. I love your recipes - keep up the great work and thank you!! made these as a treat for the kids today :) much love :) got extra kisses and I love you from them all. Made these last night. Going on a road trip this weekend &amp; wanted a special treat. Also, I subbed apple sauce for the oil. Just made these with my three year old. Used white whole wheat flour and they are yummy...not too sweet. Thank you for another great recipe and the inspiration! My son loves helping in the kitchen and I love being able to bake healthier foods with him! Ahh catherine I tried this but it came out dry and I only did it for 10 minutes. And when I had the batter it was pretty thick. Like thicker than brownie batter. Did I miss something? Mine turned out a bit dry too, and the batter was pretty thick. I took them out of the oven after 15 minutes and maybe that was even too long. Maybe a lower temp? I thought I might add 1 ripe banana next time for moisture? Also - Catherine - the recipe says it makes 12 regular or 4 mini. Just having trouble with the eggs.wondering if there are any substitutions that would work .. Have a 2 yr old with major allergy's to egg . Your recipes have been awesome . You have helped me cook things I never thoughtof making thank you! 333-you can sub out flaxseed meal (ground flaxseed) for eggs in many recipes. I think it's like 1 tbsp mixed w/ a little water, then you let it set for a few minutes and it's ready to mix into the batter. I buy Bob's Red Mill Ground Flaxseed and the specific directions are on the package. Good Luck! We made these this morning-and they were a little bit on the thick side, so I added in about 1-2 tbsp of plain yogurt, also used some olive oil instead as we don't have vegetable or canola. Added about 1 tsp of vanilla and 1/4 c chocolate chips. Also made some raspberry glaze to go on top. They weren't too sweet, which made them great for a mid-morning treat for our whole family. They baked for 18 minutes exactly and were PERCECT!!! Thank you for the recipe-it was basic and simple, and so tasty! whoops! meant to say PERFECT, not PERCECT! I think the vanilla was a good addition. These turned out delicious! Could I substitute honey or agave nectar in place of the sugar? Yes, use 3/8 Cup Honey and reduce the oil to 2 Tbsp! Yummy, we added pureed spinach for a little extra. One of the things I like best about this website is that it does use normal, basic ingredients but still provides a lot of recipes that are much healthier than store-bought, processed food. Hmmm...I must have done something wrong because they turned out very dry. I'll try again another day! I love your blog - thank you for all of your hard work! Mmmm... gonna try these out today!! My daughter &amp; I just made these for the first time today -- delicious! We read the comments about them turning out dry, so we kept an eye on them and they were great. Another wonderful weelicious recipe! These were very simple to make, thanks you. My husband, son and daughter were fighting over the last one! Thank you! My 4 yr old loved these! I increased the vegetable oil to 1/2 cup and baked at 350 degrees for 18 minutes. Perfect! Can I use olive oil instead of vegetable oil? I use vegetable oil because it is a neutral flavor. I wouldn't like the flavor of the olive oil in a chocolate muffin, but if you don't mind that then it is a great substitute! I have made these twice. The first time, I followed the recipe exactly but they were a bit dry (but still good). I made them again today and added half of a large sweet potato (mashed) and reduced the temp to 375 for 18 minutes! They turned out really delicious! Made these today - so yummy and EASY! Blogging about 'em and linking tomorrow - thank you, as always Catherine!!!! it's a bit dry and it taste salty. tried adding 1 tbsp of butter like vensel96 said (i use unsalted butter), it's still dry. Taste awful! Needs less cocoa powder I think, maybe extra sugar and some vanilla? They just taste like cocoa, not chocolate. Well...that was a kind comment. They have the right shape and texture, not dry, however they were too salty -- I think Jamie's advice's good. Or simply remove the salt? These are yummy! I've made them several times with various types of milk--regular, coconut milk, and even plain water. Of course the milk tastes the best and makes the moistest muffin, but coconut milk worked great and water was better than nothing! Hi Catherine, I love your recipes!! However I am now trying to eliminate all processed foods from my cooking, which implies no white sugar or regular white flour. Could I use whole wheat flour and honey? How should I modify the recipe for doing so? They are dry, very cocoa flavored and not sweet at all. Really good. I made them with wheat flour and I did add some vanilla too. Used a scant 1/2 cup of coconut oil and added in a baby food pouch of prunes. Baked in a mini muffin tray for 8 minutes. They came out light and delicious. I'm thinking of making them for Halloween with white icing spiderweb designs. I added a tsp of vanilla too. Dance you have an app??? I tried these yesterday. I left out the baking soda (just used the recommended amount of baking powder) and used butter instead of oil and they weren't overly sweet, just slightly - but they were still good! My children liked them a lot. How did it work with baking powder. The baking soda helps them rise just the right amount. Glad everyone enjoyed them! I forgot to add that after reading a bunch of the comments I cooked them less than 20 minutes - about 13, I think, and they made 12 smaller muffins in the regular muffin cups. I think that's it for my own personal adjustments! I have been looking forward to making these, and thought they would be a hit for sure; however, the oven temperature is clearly far too high to ensure muffins that aren't totally dry on the tops. I even tried to save these (having made the recipe exactly as stated) with some chocolate glaze to hide the dry tops, but to no avail. If made with chocolate chips in the batter, and perhaps a lower temp oven, these might've been enjoyable. We Just made this for my husbands bday cake - two layer bunt cake with Nutella filling between layers and melted chocolate on top as icing. The batter looked really thick - I may have Mis measured perhaps. So I added an oz more milk and Since I had dried cherries soaking in water I also added them too and a little bit of chocolate chips and turned out tasting super decadent. The only other substitutions I did was brown sugar and 2 oz of millet flour for apf. I like the ratio of sweetner to flour in your recipes. Ill try next time also using some sweet potato like one of the comments mentioned or maybe some bananas or avocado to make it more moist. I tried these yesterday thinking it would be a good pick me up. Husband and I tried one and it was very very bitter we didn’t get to finish it . Tasted more like cocoa then chocolate. I only had cake flour and ended up having to add an add'l 1/4 c. milk to get the batter to stir properly.